** 11.5" RECYCLED ART COLLAGE PUZZLE WALL HANGING** This is an interesting and creative ready-to-hang wall hanging that is 100% handmade and original. 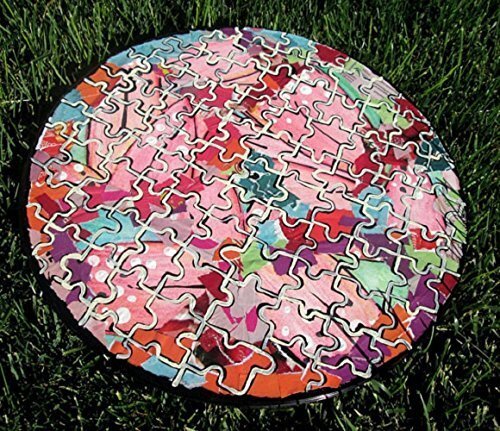 It is made from one original watercolor-and-acrylic painting and recycled pages from a magazine, with an overlayed puzzle design created using acrylic paints. This wall hanging is made from an old record (vinyl LP) (see the last photo above that shows the back of the wall hanging). This artwork is the epitome of recycled, upcycled, and repurposed. It is funky and fun, and would make a great talking piece in your home. And on top of all of that, it keeps crap out of our landfills. If you have any questions about this product by StickyKitties, contact us by completing and submitting the form below. If you are looking for a specif part number, please include it with your message.